I enjoyed my stay. The host was very nice.. first time in Cuba and I had a great view of the city. Had breakfast cooked for us every morning of our stay. Conducting business with ada was prompt and precise. Next visit will gladly stay there again!! Nice place to stay in Havana. The staff are very caring and attentive to their guests. We had breakfast out on the balcony every morning, very nice! The fresh squeezed guava juice was simply delicious also the fruit. The house is very clean and I felt very safe there. The bed was comfortable and the room was air conditioned, I was very comfortable at night. Also there is a refrigerator and a safe in each room. Word of caution (and not the hotels fault) but there really is no intervened service in Cuba, but my cell phone worked pretty well. Room tip: The room in the back on the second floor is nicest, but the room in the front has a walk out balcony. Amazing location, amazing service and amazing host! 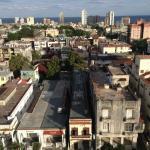 I was in Havana for 10 days for work and had to look for a place at relatively short notice. After contacting 20+ casa owners, I was super lucky to have one positive response from Ada. She owns a couple of places in Havana and manages a few others of behalf of locals. She speaks English, is super prompt with responding to emails (not common in Cuba! ), efficient, connected and is happy to help with any queries. This building has a fantastic location on 23 street in Vedado. It's got a great view of the sea and is in walking distance of many nice cafes in the area. Havana is super busy all year round these days and Ada, is super resourceful and connected in terms of finding you a place if hers are booked up. Given it was a work trip and not leisure, there were a lot of questions I had and she was super patient and happy to help. Definitely recommend getting in touch with her. I hope to stay at her colonial casa close by next time! This was a room in an apartment and was advertised as an apartment. The price charged was considerably more than the other casa we looked at in Havana but thought this was because it was an apartment. They organised a car to pick us up, 35cuc, car was a wreck (old Russian death trap) that stank of diesel and the Windows didn't open properly, we organised our own car back with cubataxi, 25cuc and a new car with ac. No warmth or charm unlike all the other places we we stayed in, the staff however were very nice and friendly. Worst of all, mattress had a plastic protector that made for a hot noisy night. Worst place we stayed in Cuba. They rent a neighbours apartment on the 19th floor which is lovely. We don't own the cars, we just organize taxi pick ups, with a local agency and we charge exactly the price they ask for. It's a service we organize for our clients, and payment is made directly to the taxi driver. We're not responsible for taxi's conditions, even though these are in general high quality taxis. Prices for pick up are higher than drop off, and it depends on the arrival time, if it's late it's more expensive. TV have access to local channels, and not only to one channel, there are about 7 local channels. You booked via an agency and prices are higher because of their fee, even for breakfast. If you book directly with us, you get a better rate for sure. They tried to overcharge on the exchange to pay the room, as they would not accept credit card, I assume so they can charge more. Later they excused by saying it was a mix of sale and buy of euro, actually it was higher than that. They did not clean the room while I was there. They claim you can check out till 3pm, they would not let me stay till 1pm. Basically expensive for what they offer, and not live up to what they claim. Been a number of times in Havana, there are better places for less. Room tip: la habitación tiene buen tamaño. creo que hay una más chica, asegurarse que no es esa. Once again I answer to your complain in order to re-confirm that your bill was in EUR and that if you pay it in EUR it's exactly the same amount, and that if you choose to pay in CUC there is an exchange rate difference. Credit cards are not accepted in ANY private business in Cuba. We did cleaned your room every day you staid in our place, because cleaning service is daily and free. I've personally verified it and you're not right in this comment. Check out is at 12h00, even thought for special requests we can accept a later check out.